Hi out there! Ok, wow, there are still a lot of you blog readers out there. It’s been more than three years since we posted with any kind of regularity, so I thought I’d write a little update on what’s happened around here in since 2015. Our farm has gotten a little bit bigger every year, and in 2018 we grew close to 20 acres of vegetables. 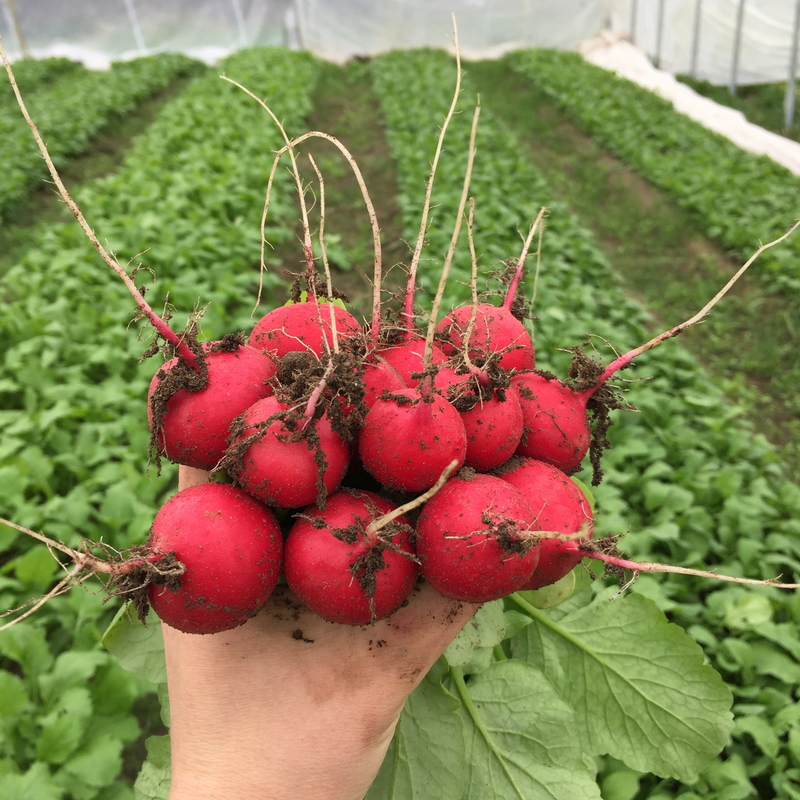 We still grow a very wide variety of crops, and our primary sales outlets are Seattle-area restaurants and our ~275 member CSA. We also have a small self-serve farmstand, which is one of my favorite things about our farm. Probably the biggest change in our operation since 2015 is that we no longer attend farmers marekts. Markets were a huge part of our life and our farm’s identity for the first 10 years, but after our oldest kid started school, we realized that we needed to find a way to take weekends off. We slowly pared down the amount that Jason and I were personally attending the markets, and focused on building up our other sales channels. By the end of 2017, we found that we could step away from our last market (we still love you, Capitol Hill!) without a scary financial impact. It’s been a bittersweet transition – Capitol Hill was our home for 10 years before we started our farm, and our community there is very dear to us. Our kids (especially Felix) just love being at the market, and we really miss seeign all the familiar faces. The best part about it (besides taking the weekends off) is that our friend Rawley, of Early Bird Farm, now occupies our old booth spot at Capitol Hill market. Rawley worked for us for two years, and we “incubated” him here as he started a pastured laying hen operation. He’s now been farming on his own land for six years, and has a cute market baby of his own. Another former employee, Bonnie, is right next door to Rawley at the farmers market, selling the food she raises at Skinny Kitty Farm. We are still there in spirit! Back at the farm, we have continued to add improvements to our equipment, storage facilities, and farm processes. We’ve increased the amount of storage produce we grow each year, and added a large (32’x16′) cooler to keep all our roots safe and cold over the winter. 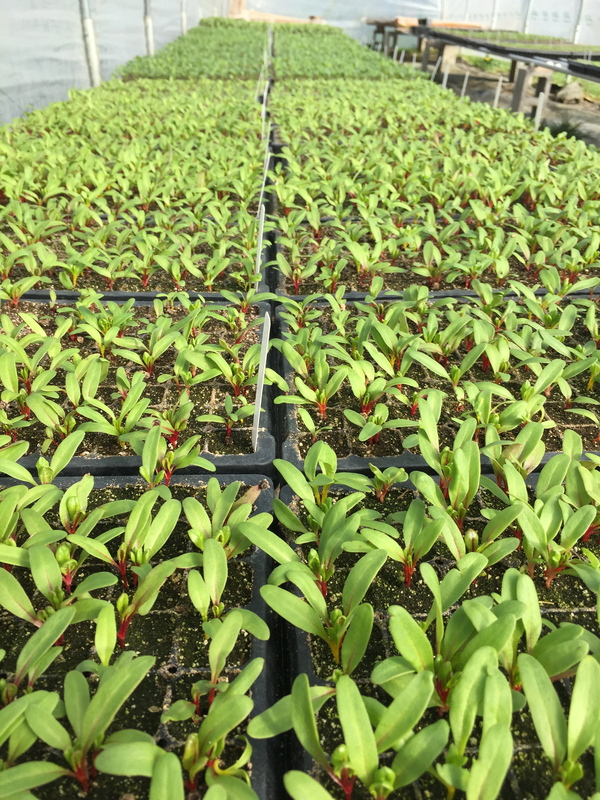 We have greatly expanded our radicchio production, and in November of 2018 we helped create Seattle’s first-ever Sagra di Radicchio, possibly my proudest moment as a farmer! Today, I’m (supposed to be) working on our crop plan and seed order for 2019. It’s my 13th time sitting down to do this task. Planning out a whole year of farming (and life) always leads me down a few rabbit holes. This year, I’m thinking a lot about how to design the farm in a way that allows us to stay engaged with the bigger world throughout the seasons, rather than being consumed by the demands of July weeding, August irrigating, and October harvesting. Why farm? Well, why do any of us do anything? Presumably, we are all in pursuit of some kind of meaning and purpose, whether having the most fun possible in our time on earth, or attempting to reverse climate change and give our kids and grandkids a better future. So… what’s your answer? Once upon a time we blogged semi-regularly. Then we had a kid, and we wrote a few posts a year. Then we had a second kid and that was that. No blog posts. Apparently, some of you are still out there reading this blog and finding your way here via searches for “Jang Seeder” and “spigariello.” Thanks for reading! We are going to give it another try, the semi-regular blogging thing. Kid number 2 is four now, and we sometimes can sit at a computer and do stuff for a few minutes. So, what do you want to know? We’ve been doing the small, direct-market vegetable thing for 12 years now. We sell primarily to restaurants in the Seattle area, through a ~300 member CSA, and at our honor-system farmstand. We grow about 20 acres of vegetables: all the usual suspects, plus a disproportionate amount of radicchio, our favorite crop. So… should we blog again? Or is Instagram all we need these days? Two thousand fifteen is drawing to a close, and we will be very glad to see it go. After one of the hottest and driest growing seasons ever, we got hit with our first flood at the stroke of midnight on November 1st. We always say that flood season begins on the first of November, and we are usually pretty well prepared for that eventuality, but it did seem a bit ridiculous to have it start literally overnight on Halloween. All in all, we’ve seen four significant floods so far this fall/winter, and there are still several months to go. Fortunately, the floods started out pretty small (only flooding our lowest ~40 acres) and got successively bigger. That meant that we were able to gradually harvest the storage crops that remained in the field, and when the last, biggest, flood hit on December 9th, all that was left to do was move things up off the ground in our barns and shops. The December 9th flood was the biggest we have had in the five years we’ve been on this property, and when we saw the forecasts a few days ahead of time we were guessing it would be big enough to get into the barn where we have two of our big walk-in coolers. We managed to get everything in there moved up onto makeshift shelves to keep it off the ground, and it’s a good thing we did, because all of our coolers did have about an inch of water in them at the peak of the flood. Water starting to creep into our wash/pack barn. A flood of this size (probably somewhere between the 10th and 6th highest since records have been kept) is a great opportunity for us to learn. We were farming in the valley in 2009 when we had the biggest flood of all time, so we have a pretty good idea of what a really big flood looks like. Every year, we discuss what our worst-case scenario situation would be: record flooding in early November, when we have three fridges full of just-harvested produce. If that were to happen, we’d load all our vans and trailer up with boxes and bags of produce and drive them off the farm to higher ground. Then we’d move everything in our shop and barn up onto high shelves or onto our farm pad (a small, flat-topped hill we built for this very purpose). Last, we’d do our best to move everything in our employee houses up off the floor, because a really really big flood would result in a few inches of water in those houses. Our front yard, with one of the employee houses in the background (the red roof, not the decrepit shack). We live and farm in the expectation that, one day, we will get another flood like the ’09 event. But this year’s biggest (so far!) was about 2.4′ lower than the record ’09 flood. We got to see what happens when the water gets high enough to start trickling through our barn, and we learned how water sort of bubbles up into our tool/machine shop through the cracks in the concrete floor (which is sort of creepy). And I think I have a better picture in my mind of what it will look like when the big one comes again: water flowing all around and under our house, and no way to get off our porch except by boat. Back steps of our house. So, with all the flood excitement of the last couple months, the hellish summer has sort of faded into the background. We wrote about some of our struggles back in July, and that was probably the low point of the season for us. After making the call to take a break from our Thursday markets, we were able to re-direct our resources toward installing and managing a complex network of drip tape and supply line. By early August, we had moved beyond panic mode and into a state of endless daily irrigation drudgery: fuel the pump, clean the filters, switch the supply line from one set of beds to another, move the mini sprinklers onto the latest seeding of salad greens, repeat, repeat, repeat. When we finally did get rain (an inch in late August), it fell on ground that was so dry it barely wetted it more than a a few inches deep. It did damp down the dust on our driveway for a couple days, and then September came with another well-below-normal rainfall. Irrigation activities continued on and on through early October! And just three weeks after we ceased irrigating, half our farm was underwater. It was a year of incredible contrasts and challenges. We feel very good about how we coped with the early and frequent flooding – we got pretty much all our storage crops out of the field, and are going into the new year with plenty of inventory in our big fridges. Plus, we got a priceless crash-course in setting up and managing 10+ acres of drip tape, so we now feel very well prepared to deal with future drought years. Every year brings new and often unexpected challenges, but I have to think that this was one of the more extreme growing seasons. Either that, or this is the new normal! But if so, well, we will press on. To 2016… and beyond! Many of you may have seen the various articles recently chronicling the ways the drought in Washington State has been impacting local farms and farmers. In the 8.5 seasons we have been farming, this one has been the hardest by far. I imagine that had we gone through a year like this before, and had systems in place for this sort of weather, we would be prepared. But as it is, we haven’t, so we aren’t. Let me explain. 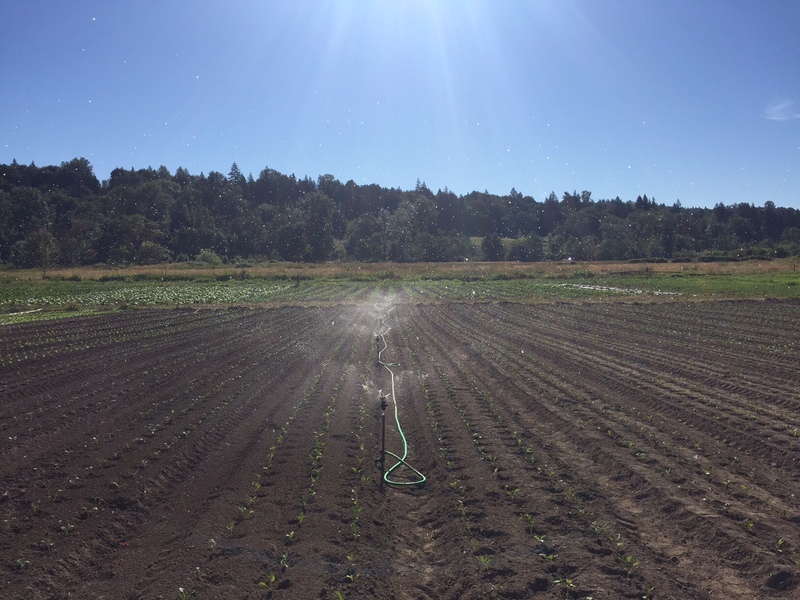 Every other year we’ve been farming, we have relied on our valley’s naturally high water table to provide the bulk of the water all our 16 acres of vegetables need to grow. We typically have been able to water in our plants once, when we seed or transplant, and never water them again; their roots quickly reaching the abundant water that’s usually no more than 18″ below the surface of our soil. This year, some combination of low snow pack, leading to the Snoqualmie River running low, and historically dry and hot weather in May and June have dropped that water table far below the root-zone of any of our plants. The consequence is that we have been scrambling to figure out how to keep 16 acres irrigated, when rather than needing to be watered once, or at most twice, in their brief life, all our plants need to be watered extensively on a weekly basis! 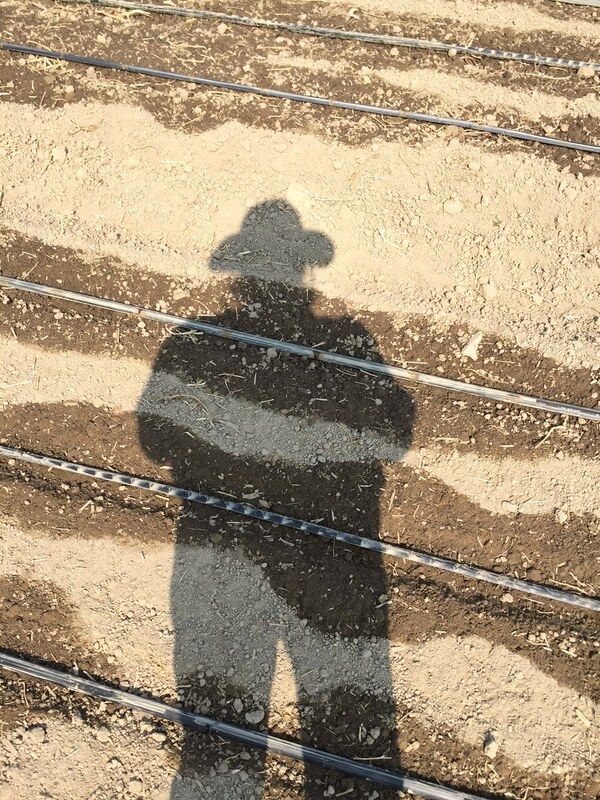 Having this dry weather happen so early in the season, when we are doing the bulk of our seeding and transplanting has made irrigation even more complicated and consequential. For over two months now, we have been devoting one or more people every day to the irrigation puzzle. It’s stretched our resources very thin. We have managed to keep most of our plantings alive, but because they aren’t getting the volume of water they need to thrive, our yields on many crops are down quite a bit. It is for these reasons, lack of people power and lack of product, that we have made the very difficult decision to take a hiatus from our two Thursday farmers markets, Queen Anne and Duvall. We hope to have these carrots for sale at Queen Anne and Duvall by mid-August. Can you find the carrots in the picture? Our hope is that we will have the resources and the vegetables to return to both markets by August 13th. Until then, wish us luck in our struggle against nature. Hello out there. Not surprisingly, it’s been quite a few months since our last blog post. 2014 was an eventful and extremely busy year on our farm, kicked off in May with the birth of our second child. If you are ever considering running a farm and starting a family, let me counsel you to avoid a spring birthday if at all possible… We had no major crises, food was grown, harvested, and delivered in greater volume than ever before, and both our kids are thriving, but let me just say that I’m looking forward to 2015 being a year where we are able to think more than 8 hours ahead at any given moment. So, that was 2014. What about the start of 2015? Well, we got to start out the new year with one heck of a flood. 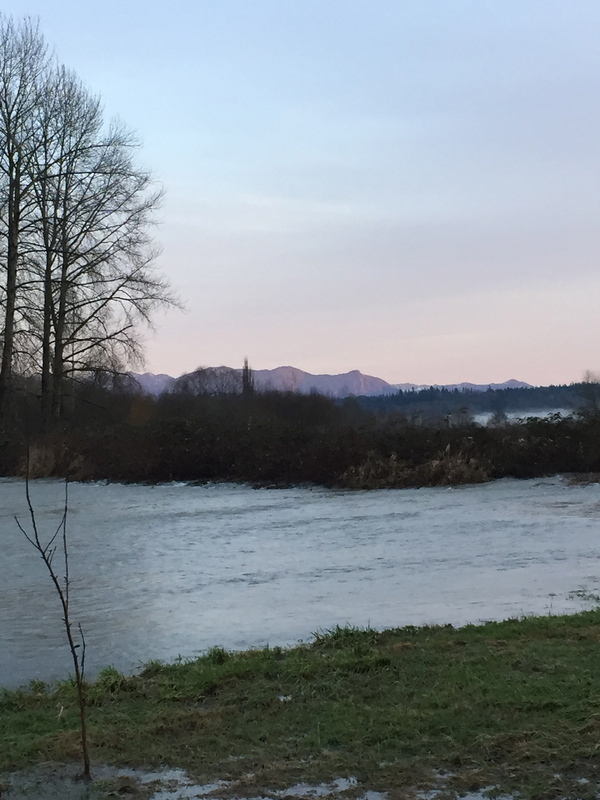 The Snoqualmie River breached its banks on January 5th after a period of intense rain and high freezing levels. When storms like this fall as snow, all is well, but when this much rain falls high in the mountains of our watershed, flooding is inevitable. As it turned out, this was the 10th largest flood ever recorded at the gauge just upstream from us, and only three feet below the all-time record flood, which occurred in January of 2009. Our farm is fairly well set up to deal with these large floods. We have a small “farm pad” where we can store some (but not all) of our tractors, vehicles, and other equipment. 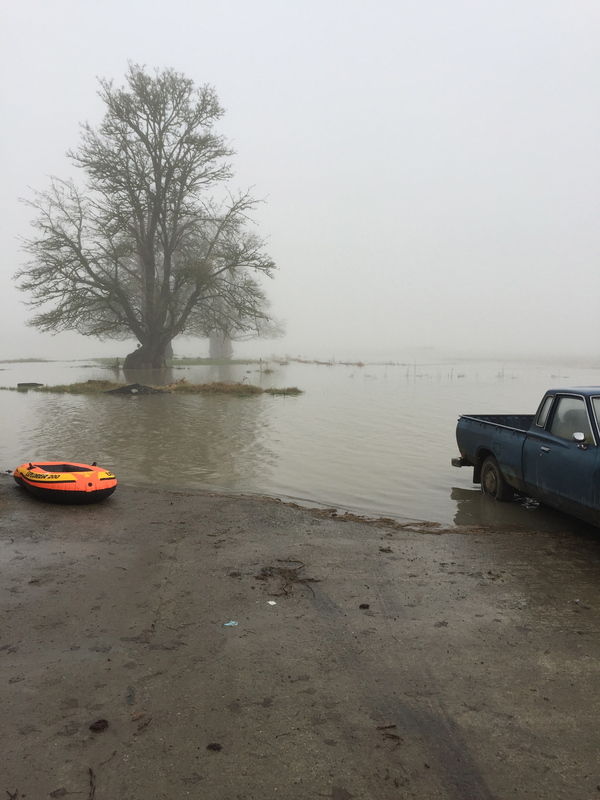 The area in and around our barns is also pretty high (mind you, 6″ makes a big difference here), but we had never witnessed a flood of this size and were not sure whether we’d see water in the barns or not. Our driveway is lower than the area around our houses and barns, so we get trapped on the farm in even a relatively small flood. This makes it tricky to deal with the vehicles and equipment that won’t fit on our farm pad. 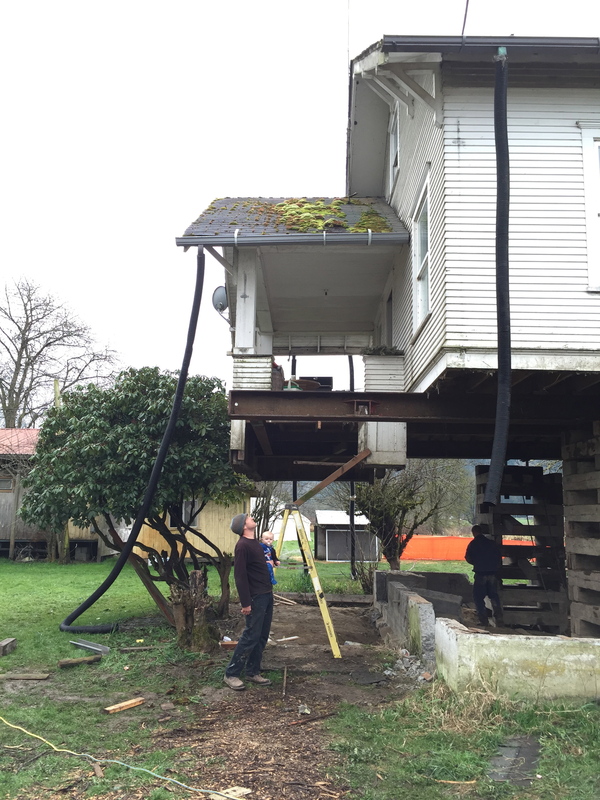 Our very wonderful neighbors allow us to store our farmstand and other trailers on their property up out of the floodplain, but to get the trailers there means Jason towing them behind our tractor on a major thoroughfare…. four round trips to get them all out. When we see a forecast for a flood of this size, we have to make a call about whether to haul these things out. Sometimes NOAA forecasts big events a couple days out, but 12 hours later the model corrects and we just get a small flood. Preparing for floods requires a balance between trusting the forecast, but being ready to ramp up the effort if the model adjusts the peak upward…. it’s quite thrilling. Our driveway and parking area, aka boat launch. Jason and Lane testing the waters… making sure current wasn’t too swift where the river tries to flow down our driveway. Boating with Felix. 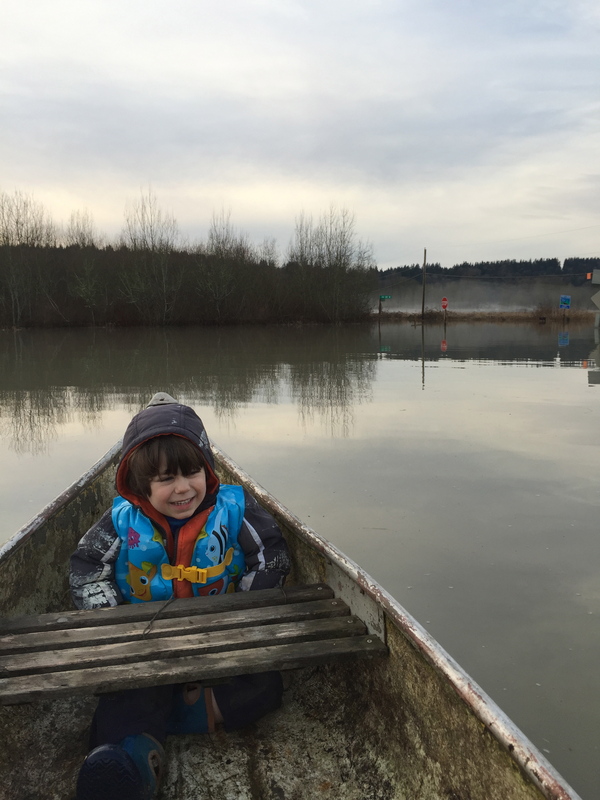 Note stop sign… this is where our farm driveway meets 124th St.
Water flowing swiftly where it jumps the river bank. We farm in a very special place. 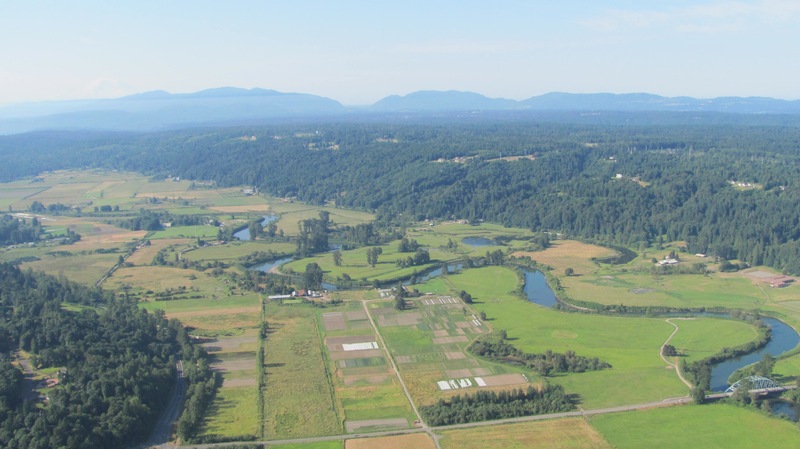 The lower Snoqualmie river valley is a small but highly fertile floodplain, just a half hour away from the big city of Seattle. It has been farmed continuously since the early 1900s, transitioning from homesteads to family-run dairies to the amazing diversity of crops that are grown here today: mixed vegetables, intensive flower fields, beef, laying hens, berries, and hay for dairy cows. It is also home to a wonderful community of farmers and friends of farmers. 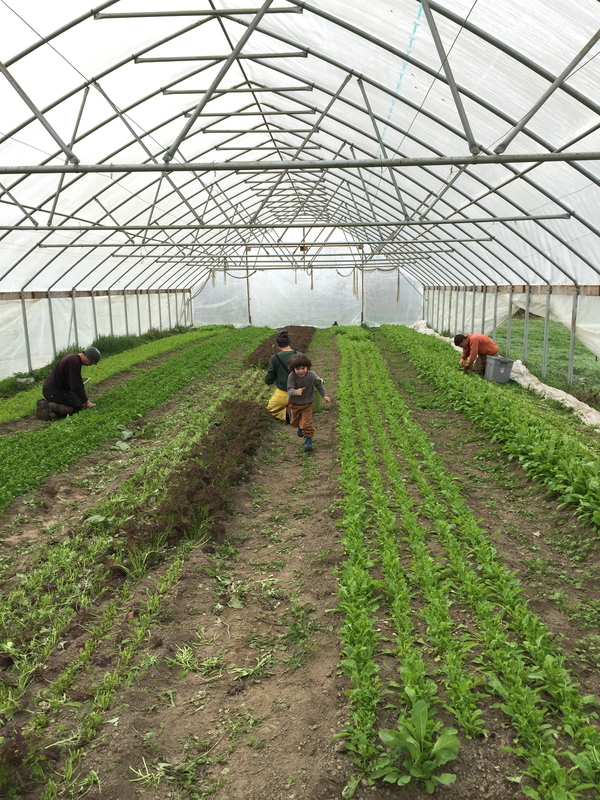 One of the mainstays of our farming community is Sno-Valley Tilth. We meet every month for a potluck and meeting, sometimes to share information with each other and sometimes to hear a guest speaker. 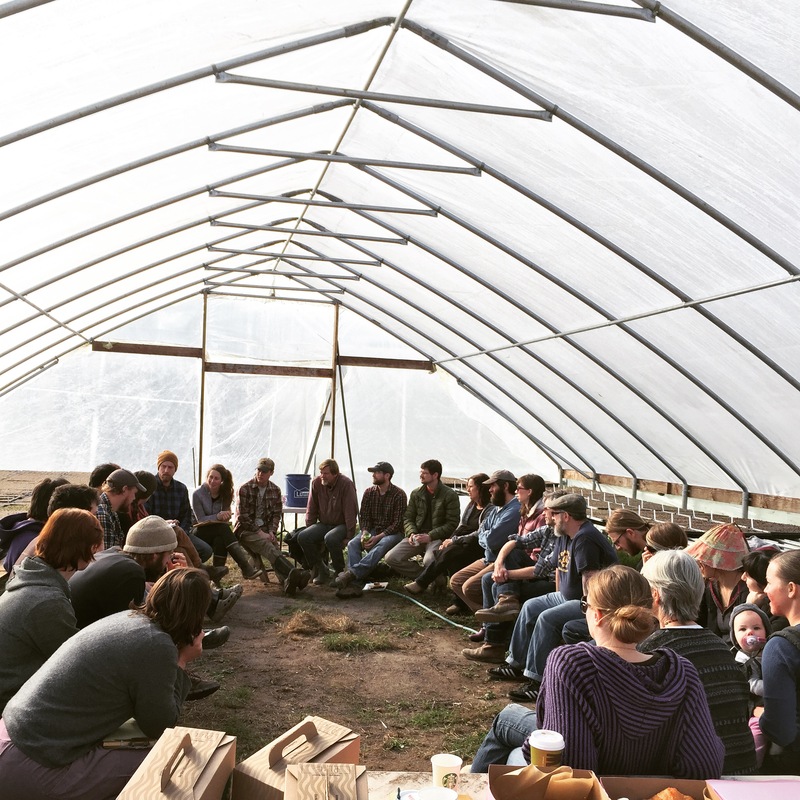 Last night’s potluck took place here on our farm, and featured UW professor and author David Montgomery. Dr. Montgomery is a geomorphologist, and he has written a great book, “Dirt, the Erosion of Civilizations,” about how agricultural soils are formed by nature and (usually) destroyed by man’s farming practices. I read his book many years ago, when we first started farming here, and was delighted to get to hear him speak in person. 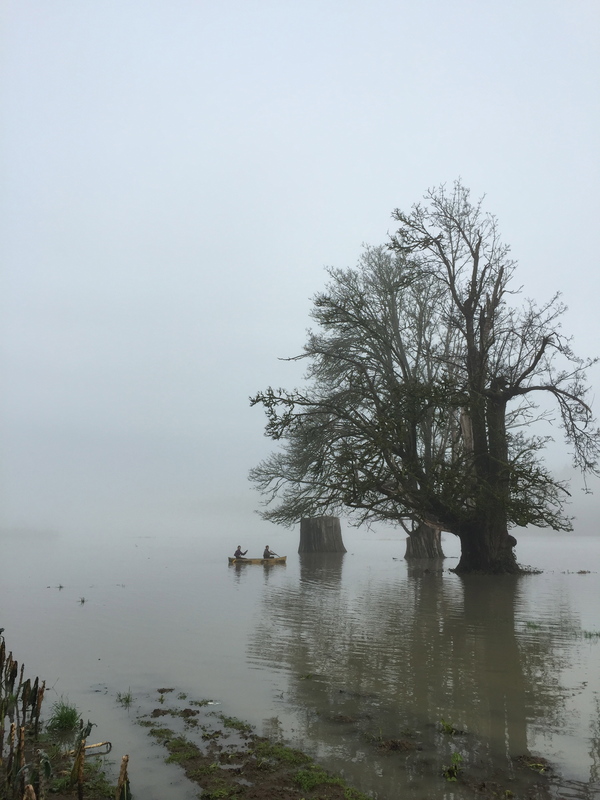 “Dirt” describes how floodplains, like ours, are the only places where civilizations have been able to sustain agriculture over the long run. The seasonal flooding we experience is, in fact, regenerative. The river brings silt and sand down from the mountains, and the floods stir it up from the river bottom and deposit it on our fields. Everywhere else on earth has soils that, when disturbed, erode and flow downstream. 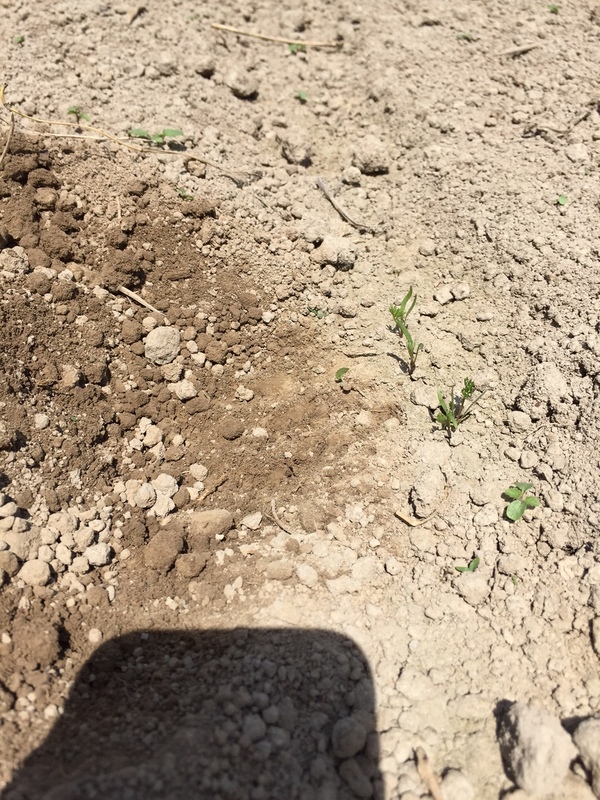 Soils, in naturally vegetated state, will grow at a rate of 1/100th of a millimeter a year. Once plowed, it can erode at a millimeter a year or more. Soil is an under-appreciated and precious resource and we are in the lucky possession of 80 acres of the best soil in the world. We take the stewardship of this resource very seriously! All of our farming practices revolve around a consideration of the long-term impacts of the soil, trying to carefully balance this with the short-term need for economic viability. I highly recommend “Dirt,” as a primer on the fascinating interrelationship between geologic forces and human civilization.